At this time of the year most of the sailboats have been put away for summer storage and people have fled north or east to their respective homes or cottages in either North America or Europe. The reason for this is it’s the hurricane season. 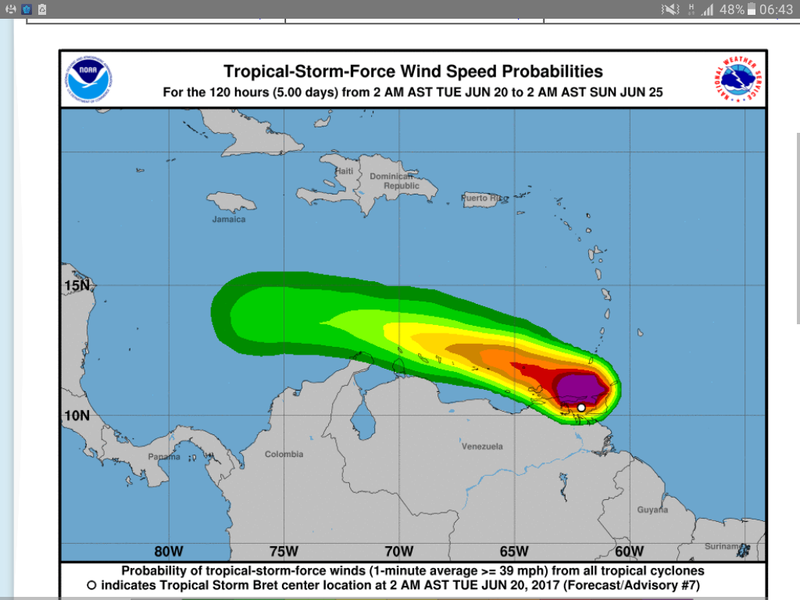 Most people have stored their boats in the supposed hurricane free zones further south in areas close to Grenada or Trinidad Tobago. These are supposedly south of the hurricane belt. We, being a little slower, are in the hurricane belt trying to make it south before most of the hurricanes occur in the months of September and October. But, it’s obviously going to be a busy hurricane season as this last storm proved. As Connie said this morning we are always checking the weather and the last 4 days haven’t been any different. We have been watching the formation of this storm since it started just west of the Cape Verde islands. We started to worry as the storm moved westward and looked around for a good anchorage in an area where there at least 300 boats at anchor. Usually the hurricanes here start to curve west north-west after starting in the eastern Atlantic. This one stayed south and hadn’t up till yesterday formed into a hurricane. We felt threatened but NOAA said conditions were not conducive to the formation of a hurricane as the system moved westward. This morning it looks like things are changing. Amazingly the system has remained south in an area that is not supposed to experience hurricanes. Technically this is not a hurricane but it looks like it may be upgraded soon. We are thankful it’s south of us and until the next weather development we will continue to nibble on our croissants and enjoy the beginning of the mango season! Stay safe you two ! !Really enjoy your posts and pictures. Next time home would really like to see a video presentation of your journey and experiences ….